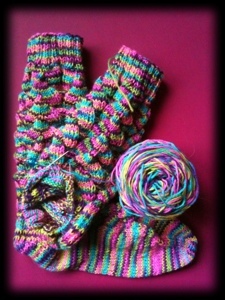 Sock yarn is Yaffle Sock in Easter Eggs, have a look in the shop!! Got my package this morning, it's even better in real life! click the image to pop in! I spend most of my time staring vacantly through the back window at the birds. When I'm not doing that or making cups of tea I knit, sew, shout at people in the street, make my own clothes and forget what I came in the room for. I live in a small village in Somerset where people talk. So don't tell anyone what goes on here. It's just between you and me, right?